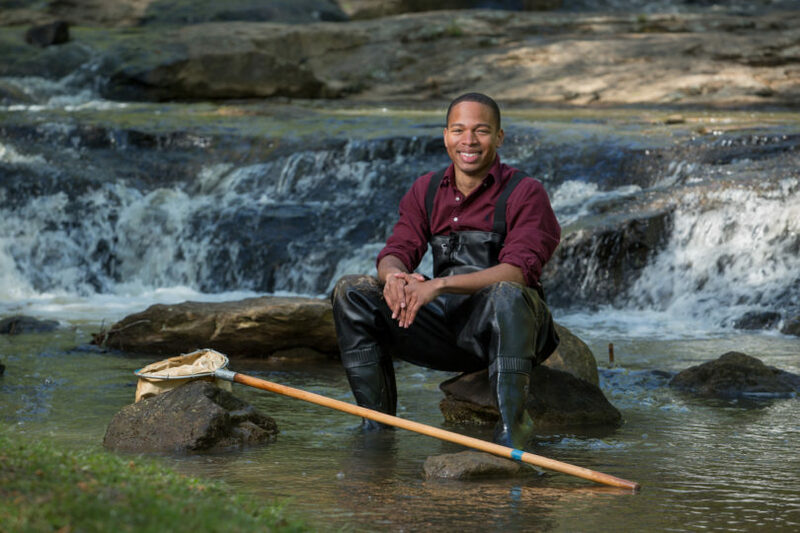 Ford Foundation Fellowship recipient Denzell Cross, a Ph.D. student in ecology and integrative conservation, believes urban water conflicts are in desperate need of innovative and creative thinking and collaborations to address environmental, social and economic issues. I am currently a graduate research assistant in the Odum School of Ecology. None, I am the first! I had the privilege of joining UGA as a participant of the Gateway to Graduate School Bridge Program, offered through the UGA Office of Recruitment and Diversity Initiatives. The professional development seminars offered through Gateway not only helped me transition into life as a graduate student, but also introduced me to resources that have greatly aided me in my first year. 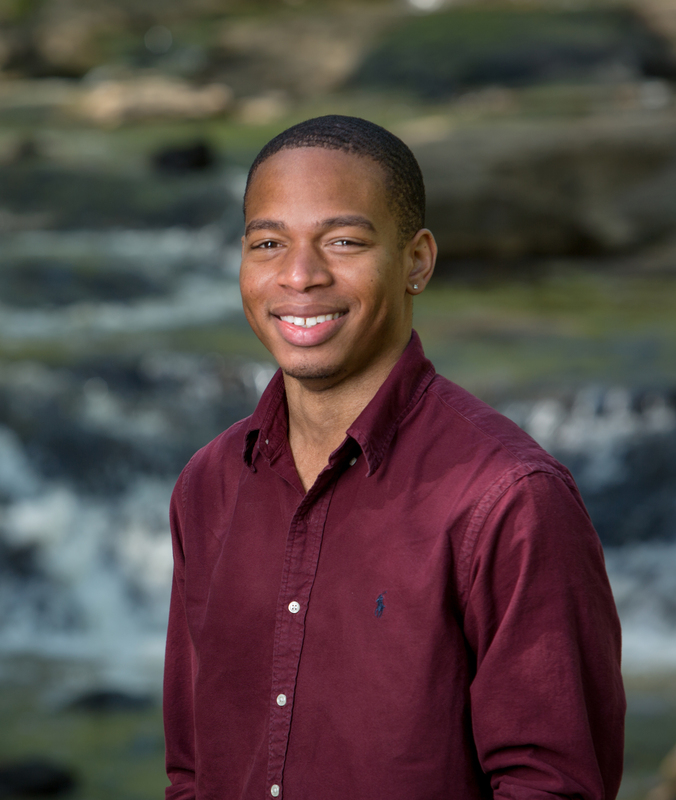 As a first-year graduate student, I was the graduate student representative for the Odum School of Ecology Diversity Committee, a committee dedicated to promoting diversity and expanding recruitment efforts to create an inclusive and supportive work climate in the school. I was also very active in an awesome K-12 environmental outreach program called EcoReach. Through EcoReach, I helped raise environmental awareness in Athens and participated in programs like the Rivers Alive River Cleanup and the Athens Water Festival, as well as a variety of outreach programs at the public library. In the spring of 2018, I was awarded a predoctoral fellowship from the Ford Foundation, which will support three years of my graduate study. The goal of the Ford Foundation Fellowship is to increase the diversity of the nation’s professorship and to enhance the number of researchers in academia using diversity as a tool to enhance the education of all students. As a Ford Fellow, I am looking forward to integrating community-based education, K-12 and undergraduate mentoring into my dissertation research and long-term career goals. Before I came to UGA I worked as a laboratory technician at the Joseph W. Jones Ecological Research Center in Newton, Georgia. The Jones Center is in collaboration with the Odum School of Ecology and the Warnell School of Forestry and Natural Resources, so most of the people I would work with on the job were either current students of UGA or alumni. Hearing their experiences of living in Athens and going to school at UGA, as well as the research they were doing for their thesis or dissertation for their respective programs, put the school on my radar for graduate education. They shared stories about how lively the Athens and UGA community were, from the music and food scene, to the events and festivals that go on downtown. With that, seeing the pride and joy the locals in Newton had for the Georgia Bulldogs convinced me that UGA and Athens would not be too shabby of a place to go to school and potentially live at for the next several years. While this was happening, I had already started to read scientific papers to discover specific areas of research within aquatic ecology I would be interested in pursuing in graduate school. While reviewing the literature not only did I keep stumbling across the same names over and over again, I realized that a lot of these scientists were currently teaching at UGA or else had received their graduate education at the University of Georgia. My employer at the Jones Center at the time, Dr. Steve Golladay, adjunct professor at UGA, is also an amazing guy and scientist whose research taught me a lot about the field. So, when it came to my interest in water resources, UGA, and more specifically the Odum School of Ecology, had established itself as one of the best programs out there. I contacted Dr. Krista Capps, who was at the time looking for a student to conduct research in urban stream ecology and after a few conversations, I was able to visit the campus for the first time. After that visit I was immediately sold. The campus and UGA community was everything that my colleagues at the Jones Center had pitched it as, and then some. Also, the community at the Odum School was amazing. From the undergraduate and graduate students to the faculty members — everyone was friendly, motivating and encouraging. To top it off the quality and diversity of research that was being done by the students and faculty of the department was impactful and incredibly interesting. It was also during my first visit that I learned of the Integrative Conservation (ICON) program at the university, which trains students to address conservation issues utilizing multiple disciplines and fields to develop innovative solutions. The goal of the program fell in line with my desire to conduct research in water resources while also interacting and engaging with stakeholders that heavily relied on them, whether it be through management or policy. From the academic curriculum to the social life, long-term goals and future opportunities, UGA was the best choice. I will never pass up an opportunity to explore UGA. It’s always cool to pass through North Campus while heading downtown, or else pass by the football stadium walking down Stanford Drive. There’s also the Trial Gardens and turtle pond near the ecology building that is always enjoyable to stroll through when the weather’s nice. When I do have free time, I have absolutely zero regrets using every second of it to catch up on Netflix or go to the movies. I was a big movie-goer before I started school, but, as duty calls, that hobby had to take a back seat once the semester started. I also enjoy going downtown with friends and checking out what’s the latest-and-greatest in the Athens community. … weather permitting, it would have to be the courtyard in the ecology building. As there are quite a few days during the week where I end up spending most of the day inside, it’s always refreshing to go outside when I get the chance. The ecology courtyard is a cool place because it’s not too busy, has some nice shaded areas, and there are stringer lights in the courtyard rafters, so you can even study in the evening. All the professors that I have had the privilege of learning from in both the Odum School and ICON are amazing. Though if I had to choose one to talk about it would undoubtedly have to be my advisor, Dr. Krista Capps. Her passion and enthusiasm for the field of freshwater ecology is contagious. I consider myself extremely dedicated to the field myself, but every time I have a meeting with Dr. Capps, whether it be to discuss my own research or other ideas for the lab, I leave feeling five times as invigorated than when I walked in. Although I have never been an actual student in any of her classes, I was fortunate enough to support her Urban Ecology class this last spring. In her lectures, she always brings unique energy and charisma that makes me wish I had a professor like her when I was in undergrad. She is incredibly inspiring and encouraging. Since I’ve started school, she has challenged me to think about my research on much deeper levels, and she has encouraged me to push myself beyond what I think I am capable of doing. Her support has helped me overcome many of the obstacles (both real and perceived) I have had to face as a graduate student. This will have to be a tie between two people: Denzel Washington and Stan Lee. My mother was, and still very much is, a huge fan of Denzel Washington and really, really liked the name. Thus, I am also Denzell (with two l’s for a bit of originality). I will say though that since I was a young he has become one of my favorite actors and I cannot name one of his films that I do not enjoy. Now, Stan Lee, he is a true creative genius. His work made my childhood that much more enjoyable and even now with all the MCU films, his legacy still brings me times of great enjoyment. I would like to share an afternoon with them both for nothing more than just to talk about the world. They both strike me as very abstract thinkers and it would be cool to hear their take on current issues in society from their points of view, and of course, I would also thank them both for their unknowing influence on my life. Tough question because from a mental standpoint, most, if not all, of what I attempt, I do so with the mindset that it can be accomplished, no matter how unbelievable or difficult it may sound. I don’t really view a failure as failing, it is more of a setback. I try to view any goal with a mindset that it can be accomplished with hard work and perseverance. The short answer: The thought or fear of failure is not really a factor in anything I decide to do. If I had no financial limitations I would definitely spend more time traveling. I’ve been out of the country only a few times in my life but have always wanted to explore the world more. I have a “top 10” list of places I would like to visit that I will hopefully get started on sometime soon! I’m interested in learning and exploring the myriad ways human beings interact with the natural world, in ways that are perceived as both positive and negative. My passion is to critically examine human-environmental interactions, specifically focusing on water resources in urban settings. I feel urban water conflicts are in desperate need of innovative and creative thinking and collaborations to address environmental, social and economic issues. This is especially true in underserved communities. As an ICON Ph.D. student, I’m hoping to use my research program to examine these interactions across a variety of scales and through an interdisciplinary lens. … obtain a postdoctoral position that will allow me to continue to conduct research investigating the impacts of urbanization on the structure and function of aquatic communities. Eventually, I plan to be a research ecologist. Through my work I hope to continue studying urban freshwater systems and continue collaborating with community science groups and a diverse set of stakeholders. I hope to continue working in the Southeast and would be especially excited to continue working in Atlanta. I will always remember my orientation day at the Odum School of Ecology. I was excited, anxious and very much overwhelmed. I distinctly recall how intensely I felt the “imposter syndrome” that day. I remember sitting in the seminar room with the other first-year graduate students listening to the dean, the head of the graduate committee and the academic advisor talk to us about degree requirements, mandatory classes, completion times, deadlines, forms and documents. My thought ranged from, “Yeah I’m ready! This sounds great! Tell me more!” to “Why did I decide to do this again?” I still battle the “imposter syndrome” from time to time, but since that day, I have made great friends inside and outside of my lab and the school. I have also made wonderful, lasting memories. I am thrilled to be at UGA and excited to see where my dissertation research and professional development here takes me in the future!